Limited System Operators –small drinking water systems (e.g. mobile parks, camp grounds, designated facilities) whose source water is either surface or groundwater. 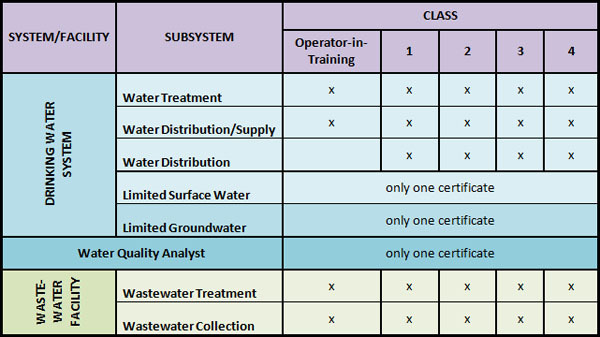 Certified operators are responsible for performing such duties as: conducting operational checks; adjusting, testing, or evaluating a process that controls the effectiveness or efficiency of a drinking water subsystem or wastewater facility; adjusting or directing flow, pressure, or quality of water or wastewater. Individuals who only conduct drinking water testing services must still be certified. They require a Water Quality Analyst (WQA) certificate. While WQAs are not considered “operators”, they can perform a limited number of drinking water testing services which can also be performed by certified operators. These subsystems may employ different types of operators, ranging from new operators who hold an Operator-in-Training (OIT) certificate, to those who have progressed through higher class levels and are generally required to operate more complex systems and facilities. Individuals who only conduct drinking water testing services must still be certified. They require a Water Quality Analyst (WQA) certificate. Drinking water systems and wastewater facilities are classified according to their relative operational complexity, based on a scale of Class 1 to 4 (with “1” being the simplest and “4” the most complex). Operator certificates and licences are leveled in the same way. The certification and training requirements for each class of certificate and licence are directly related to the classification of the system or facility they work in. Operators wishing to upgrade to a higher class of certificates and licences must pass additional exams and acquire more training and experience. Most operators hold multiple types of certificates or licences as they operate in multiple subsystems, such as water treatment AND water distribution, however, an operator can only hold one certificate or licence of each type. For example, an operator with a Class 2 Water Treatment certificate cannot also hold the Class 1 Water Treatment certificate. In addition, operators may only upgrade to a higher class if they hold the lower class certificate or licence. The chart below illustrates all of the possible certificates and licences that may be required to operate and/or provide testing services in the province of Ontario.